This item is a business card for attorney W.D. 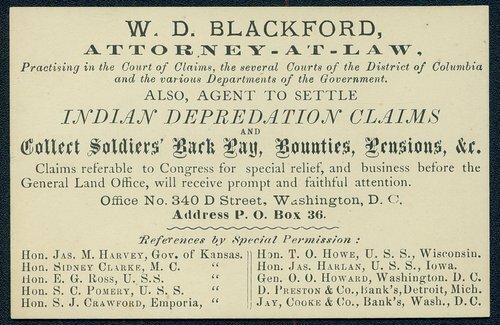 Blackford, and it indicates that he specialized in claims, including "Indian Depredation Claims." References include Governor Harvey of Kansas and former Kansas Governor S.J. Crawford of Emporia, Kansas. Collections - Manuscript - Miscellaneous - Misc. : Eu-Fa - Farnsworth, H.W.